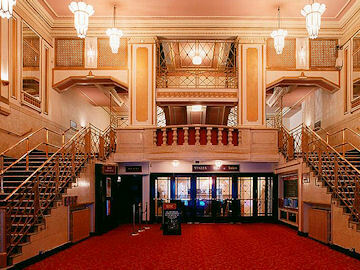 The Dominion Theatre was built in 1928 - 1929 from the design by T R Milburn and included Art Deco furnishings and a portland stone facade. 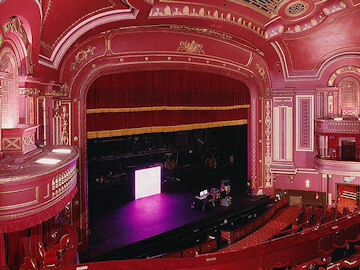 It had 2,800 seats and was intended for stage plays but in the early 1930s was converted to also be used as a cinema to increase audiences. 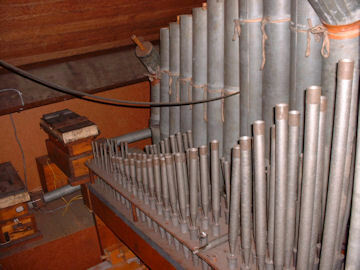 It was equipped with a Compton 3/13 theatre organ which was later removed and installed without special theatre organ effects in a church in Llanelli. In 1957 the theatre put on the Judy Garland show and among films shown were "South Pacific" in Todd-AO and "Lawrence of Arabia". More recently it has been used as a theatre again with musicals such as "Time", "Grease", "The Beauty and the Beast" and now, "We Will Rock You". 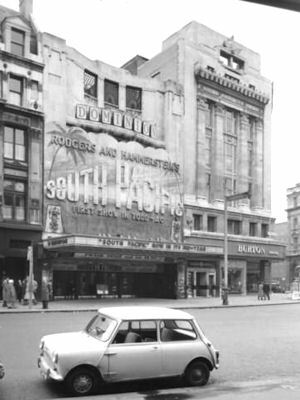 I was lucky in the late 1950s to be taken to London by my mother to see "South Pacific". 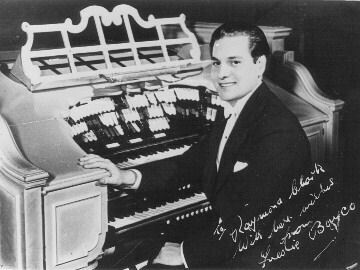 Organists at the Dominion included Frederic Bayco (resident), the principal organist for the Gaumont British Picture Corporation, Felton Rapley and William Davies. Removal from the Theatre. 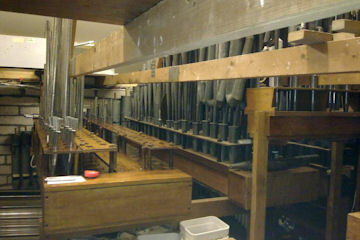 When the organ was removed from the theatre it was installed in "straight" form in a church in Llanelli, Wales. It suffered during its time there and was in a pretty sorry state when removed by a private collector in 2002. 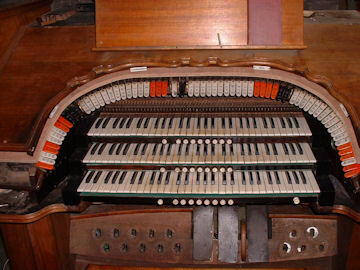 The console was sold separately and has subsequently gone missing but the pipework has been incorporated along with that from the Ritz, Potters Bar Compton 2/7 in a private residence just outside Cardiff. 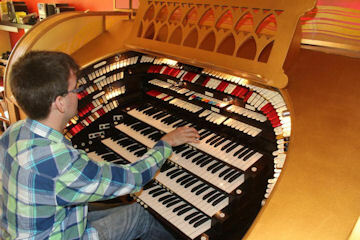 The new installation consists of one pipe chamber and the console is the one from Aylesbury Civic Centre built by David Pawlyn and based on the Radio City WurliTzer. Compton stop units are used but with WurliTzer replica tabs. 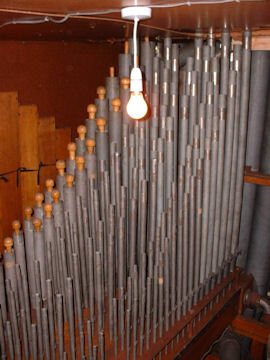 Pipes from Potters Bar are the Tibia, VDO, VDO Celeste, Stopped Flute, Diapason and Vox Humana. 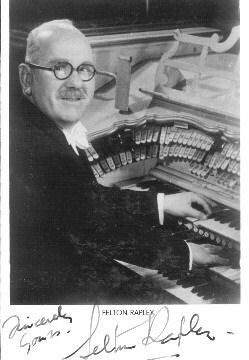 From the Dominion came Tibia, Cello, Gamba, Gamba Celeste, Concert Flute, Diapason, Tuba, Orchestral Oboe, Clarinet, French Horn and Trumpet (from the Tivoli on the Strand Compton which replaced the original Krumet in the cinema). 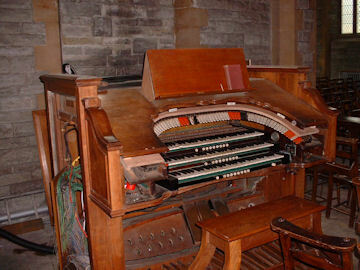 The console of the Cardiff organ. 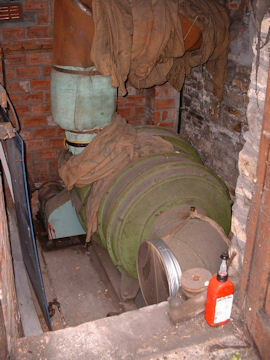 Part of the new pipe chamber. My grateful thanks to the General Manager of the Dominion Theatre, Peter Hammond and Ben Snowdon for their help with this page and permission to use the photographs. 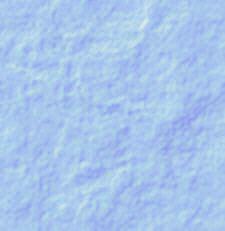 Copyright © 2014, Chas Girdwood.